Take a journey into the past during a stay at the secluded Hotel Waldhaus Sils. Boasting superior views of the mountains and forests surrounding the property, the hotel stands frozen in time, with old-world comfort, but full of modern conveniences for the modern traveler. Executive Chef Kurt Roosli is a master in his kitchen, churning out delectable dishes for hotel guests. There's plenty of activities for hotel guests to try, including mountain-climbing and hiking along the trails. Hotel Waldhaus Sils was awarded Best Historic Hotels Worldwide hotel in Europe for the 2017 Historic Hotels Awards of Excellence. 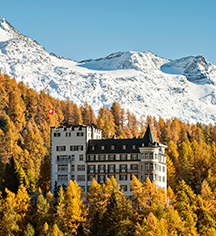 Hotel Waldhaus Sils, a member of Historic Hotels Worldwide since 2014, dates back to 1908. Upwards of 3 million Swiss francs are spent each year to ensure the best experience and environment for the hotel's guests. Hotel/Resort Fees & Taxes: A tax is imposed by the city: CHF 4 per person, per night for adults; CHF 2 per night for guests aged 6-12 years old. This tax does not apply to children under 13 years of age. Pet Policy: Service animals allowed: Yes. Pets allowed: Yes. Dogs only. Fee: Please contact hotel for more information. Maximum amount may apply. Shuttle Service: Shuttle service scheduled through the resort's concierge. Transportation: Chauffer, may be arranged through the concierge; rates apply. 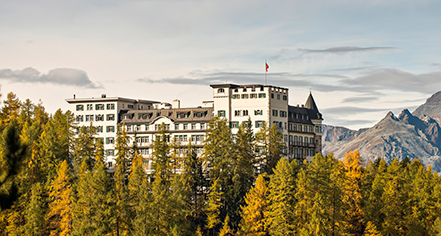 Take a journey into the past during a stay at the secluded Hotel Waldhaus Sils. Boasting superior views of the mountains and forests surrounding the property, the hotel stands frozen in time, with old-world comfort, but full of modern conveniences for the modern traveler. Learn more about the History of Hotel Waldhaus Sils .